Though this glimpse likely doesn't show any actual footage from season 8, it does bring back three powerful Starks: Jon (Kit Harington), Arya (Maisie Williams), and Sansa (Sophie Turner). The official Game of Thrones S8 teaser trailer is finally here. The camera further cuts to Arya, who walks down the hallway, and then shows Jon passing Ned's statue. 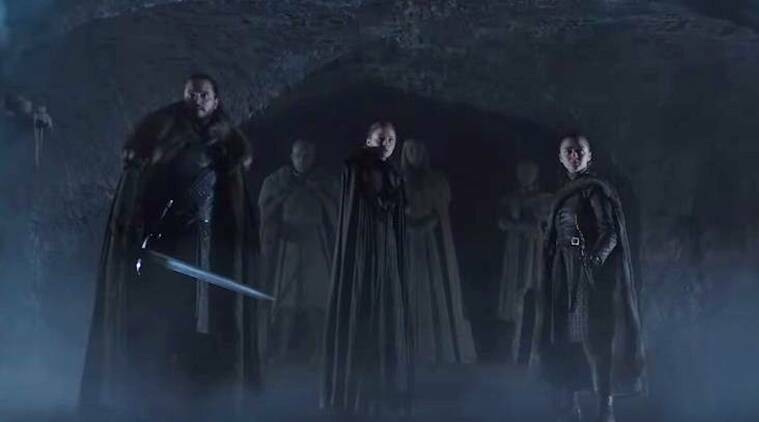 The teaser depicts the underground crypt of Winterfell, with Sansa Stark, Arya Stark and Jon Snow facing their own statues as frost approaches through the tunnels. The final season will have only six episodes, making it the shortest season. Winter is nearly here: HBO has just dropped a mind-blowing 90-second-long Game of Thrones season 8 teaser, which is giving fandom the creeps. Technically, Jon's real name is Aegon Targaryen but he is a Stark by blood thanks to his mother Lyanna. Game Of Thrones fans, this is it - the countdown to the beginning of the end. Everything starts freezing - even the feather dropped from Lyanna Stark's statue. Daenerys comes face to face with Sansa Stark in Winterfell. Martin is working on the next book in the series, and is an executive producer on HBO's upcoming Game of Thrones prequel series. The Night King's (Vladimir Furdik in Season 6) army is heading south, and a battle appears to be imminent. HBO unveiled a brief preview of season eight on Sunday, and it whets the appetite very much.